Hiring a commercial concrete repair team is anything but an easy task. How can you tell the differences between two companies when they’re essentially doing the same work? How much should you value estimates and experience? Keep reading to learn the most common mistakes to avoid as you make your decision. Looking only at price – Property owners in Denver try to save money wherever they can. That said, it’s not a good idea to try pinching pennies on concrete projects. Keep in mind that the cheapest contractor may not be the best. 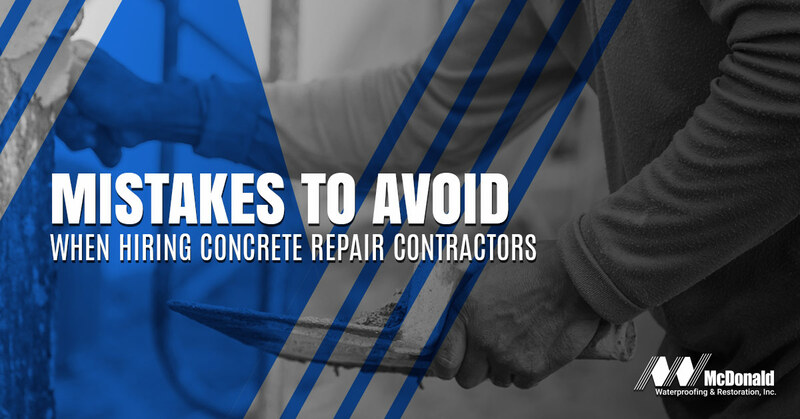 Low-quality concrete work can look bad and be even more expensive to repair or replace altogether. If you want your property to look beautiful and be safe for everyone, be willing to spend a bit more. Remember that you’re making an investment here. Not checking qualifications and references – This isn’t the time to opt for a concrete repair company that just got started. Experience and the proper licensing are key with major commercial projects. Don’t stop there with your research, though. Whoever you choose should have a good reputation that’s been established for years. If for whatever reason you can’t find customer testimonials and the company is unwilling to provide references, a red flag should go up in your head. Not getting quotes – You’re going to spending quite a bit on this project. So make sure to get the best value and service. As aforementioned, think of this as an investment. Therefore, the decision-making that’s involved shouldn’t be taken lightly. Allowing the contractor to use inferior materials – It goes without saying that a project is only as good as the materials used during construction. With the amount of money you’re spending on the work, the company you select should be using the absolute best. Letting the company cut corners – You’d be surprised at how many concrete repair teams do lackluster work. Whether it’s an effort to save money or time, you shouldn’t have to put up with anything less than a high-quality job. You deserve to work with the best. McDonald Waterproofing & Restoration is a specialty concrete repair contracting firm that that provides services to commercial property managers and owners throughout the Rocky Mountain region. We are the Mile High City’s choice for commercial parking structure repair, specifically concrete strengthening and concrete protection. Since McDonald was founded in 1999, our mission has remained the same: Offer the best value for clients by developing and implementing innovative processes to solve demanding design and engineering challenges. We provide a number of reinforcing concrete solutions, including concrete crack repair, expansion joint repair, and concrete patching. Call us today to get started.